I have always been curious about the Elite trailer. They don't do a lot of advertising. Formed in 1995 by Robert Walters and Wayne Purser Jr. they set out to build a better trailer - not more of them. Close inspection reveals why Elite claims quality to be it's greatest attribute, especially if you know anything at all about welding. Don't take my word for it . . . . my father-in-law is in the aircraft business - disdains horses - but was duly impressed with the quality of aluminum welds he witnessed. In fact - fascinated would be a better word. Now I had a chance to actually pull an Elite . . . and report back. The wife needed to pick up a three year old filly she just purchased from Jud Little so I thought the trip down to Ardmore, Oklahoma and back to Kansas City would be a good opportunity to test drive a trailer. Tommy Farrell owns and operates Farrell's Trailer Sales in Oklahoma City and wondered if I would be interested in their "Mustang" model. It was sitting at Tener's Parking lot on Reno Avenue during the AQHA World Show this past November - a good looking trailer. While my trip to pick up our new filly was delayed, we eventually completed the haul and I was able to get a close up look at what makes the Elite so bold as to name itself "Elite". Here's some of my observations. Nobody goes out to buy an ugly trailer - but some go out of their way to choose an especially sharp looking trailer they feel good about pulling. 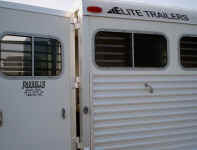 The Elite trailer stands out as one of the better looking u nits you'll find at your local jackpot, rodeo or endurance ride. The name Elite was a good choice, though I believe the company could spend more dollars promoting the brand. Maybe they put some of those advertising dollars into their trailer. Could be. 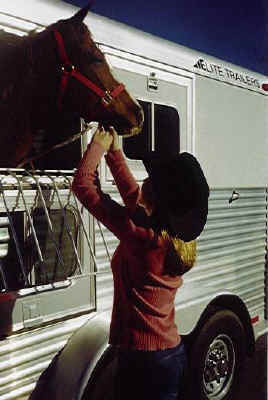 While you can find a number of trailers that are safe and look pretty snazzy - there's one more category of horse owner that we should consider. The "abusers". 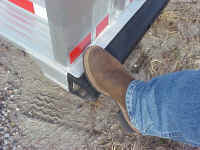 That's right, there are horse lovers who knowingly abuse their trailers, and expect them to last forever - and they don't want to spend more than the horse their hauling. The Elite Mustang fits this category of buyer well - a sharp looking rig, a great sounding name, while getting an affordable bullet-proof tank, built to last. Well, I can't really say they are bullet proof. Just a figure of speech since I didn't fire off any small arms fire in it's direction. Here's some of the features I liked. 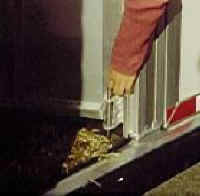 Every time I look at a horse trailer some salesman tries to show me their hinges. (I'm glad it ends there.) 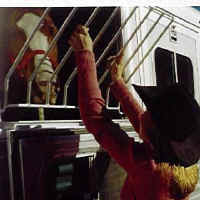 They drop a window and begin twisting at it with bulging forearms. I've never seen a window snap and separate under this abuse . . . and I'm pretty sure I won't spend my time trying to do this myself, although I did try tearing a phone book in half once in college. But I have to admit . . . I like these big old hinges. I consider them a big plus. Elite has great hinges! It gets hot in most of the country during the summer and dropping your windows is required. You can debate whether to use screens or bars, but I personally like the bars if they're easy to remove. These are. It keeps my horses' head inside where it belongs and as you can see, my Elite Cowgirl has no problems either. I don't like to be bothered when I have a baseball game on the radio . . . so if the kids can't handle the trailer windows, it's not a good thing. I seldom have a reason for moving my rear tack wall out of the way - but then again - my lawn tractor has yet to break down. If it does, getting rid of the rear tack wall should not be a pain. 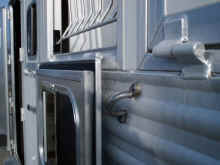 Most trailers use an easy-to-pull pin. 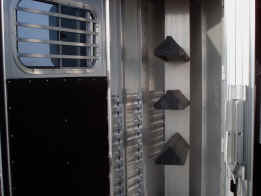 Elite also makes a very easy to use spring latch for the divider gates. I checked this out for both genders, since what I find to be easy to handle may not be so easy for my wife or daughter. It passed with flying colors. 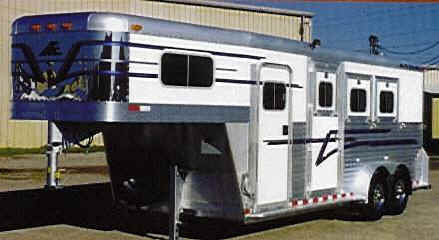 The 3-horse trailer shown here is 7' wide and 21' long. (and 7' tall) This should accommodate all but the largest of beasts unless you're into draft horses, mature kangaroos or buffalo hauling. (Two-5200 lb. axles should handle all of the above- standard). 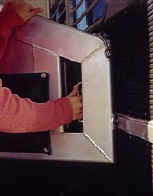 Side walls are both insulated and lined with rubber and this unit also comes with floor mats and padded dividers. You also get carpet in the dressing room, three saddle racks on a removable post and well positioned bridle hooks, clothing rods and blanket bar. Tie rings were well placed and firmly mounted. Not necessary, but certainly appreciated is the number 8 mirror finish stainless steel nose. Elite has built a reputation for durability and ruggedness. Each trailer is made to order. The exception to this rule is the Mustang (pictured here). It's the only production model available from Elite and it's introduction in 2002 was needed because of the high demand from dealers for the Elite brand. While some trailer manufacturers worry about the economy, Elite is planning to double it's production capability with new facilities due to be completed later in 2003. (From an interview with Phil Key, National Director of Sales and Marketing - Elite Inc.). Just owning an Elite will put you in an "Elite" group. There's not many around. Finding a dealer is a task with only 30 or so in the entire country. One of the newest dealers is Farrell's Trailers in Oklahoma City, where you can buy this particular Mustang . . . pulled only once! Additional pictures are listed below. 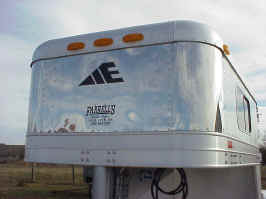 The Elite Mustang in this trailer review can be purchased through Farrell Trailers in Oklahoma City for a special website trailer review discount.. or call Tommy Farrell at 1-800-657-7305 for more information. Striping graphics are optional and shown here on a similar 3-horse Elite.